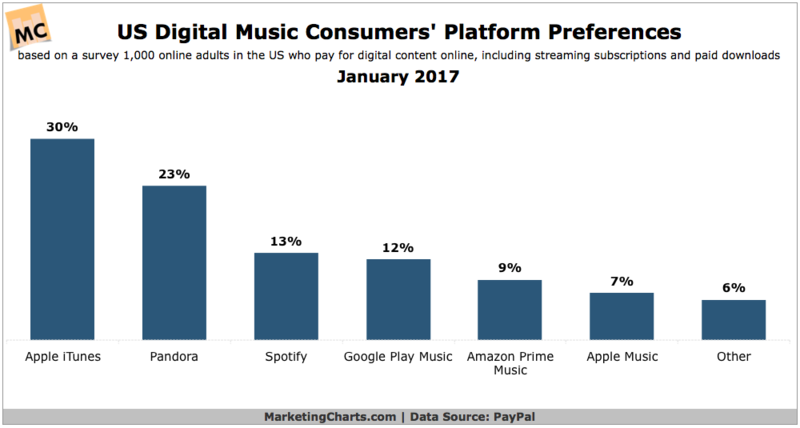 Apple is the top platform for US adults who pay for music content online, ahead of others such as Pandora and Spotify, according to a study from PayPal [PDF]. Among the US music consumers surveyed, 37% cited either Apple iTunes (30%, the single leading platform) or Apple Music (7%) as their preferred platform, while Pandora picked up 20% of the respondents. Spotify (13%) was next, closely followed by Google Music (12%). The study notes that, overall, paid downloads are more popular than streaming. But there’s an important distinction to make between age groups: Millennials (18-34) were slightly more likely to pay to stream (63%) than to download (60%) while older listeners showed a clear preference for downloads (70%) over paying to stream (51%). Read the rest at MarketingCharts.